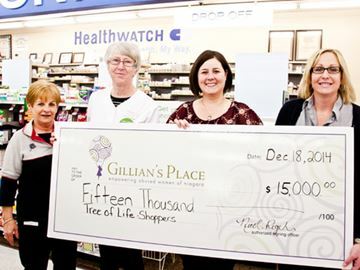 Five Shoppers Drug Mart locations in St. Catharines teamed up to raise $15,000 for Gillian’s Place as part of the 2014 Tree of Life campaign. The funds were presented last Friday at the Northend Plaza location on Lakeshore Road. Pictured are, from left, Lois Hicks, Janice Coholan, Gillian’s Place Community Development Manager Nicole Regehr and Julie Shale. ST. CATHARINES — Gillian’s Place received an early Christmas gift thanks to the staff and customers of Shoppers Drug Mart. On Friday morning, Shoppers Drug Mart representatives presented a cheque for nearly $15,000 to Gillian’s Place, as part of its 2014 Tree of Life fundraising campaign. The funds were raised through the combined efforts of Shoppers Drug Mart, its store teams and customers, with five stores in St. Catharines contributing to the cause during the campaign. With more than 1,240 Shoppers Drug Mart and Pharmaprix stores across Canada participating in the four-week campaign, the 13th annual Tree of Life campaign will provide support to nearly 500 women’s health charities, including Gillian’s Place. National in scope, yet locally based, the campaign offers patients, customers and employees the opportunity to donate directly to charitable organizations to ensure resources and programming are available to meet the needs of women in the community. In St. Catharines, the Tree of Life proceeds for Gillian’s Place were harvested from local customers and employees at the Grantham Plaza, Scott Street, Port Plaza, Northend Plaza and Martindale and Fourth Avenue locations of Shoppers Drug Mart. Gillian’s Place is an organization that provides safe shelter with a full range of support services for abused women and their children from Grimsby, Lincoln, Niagara-on-the-Lake, St. Catharines, Thorold, and West Lincoln. These essential services include 24-hour support counselling, safe shelter, safety planning, emotional support, legal advice and transitional assistance. Gillian’s Place also works diligently to provide public education and raise community awareness on the issue of violence against women. In addition to the traditional Tree of Life campaign, which has raised more than $23 million for Canadian health charities since 2002, local stores went over and above collecting donations by holding several charity barbecues in support of Gillian’s Place.